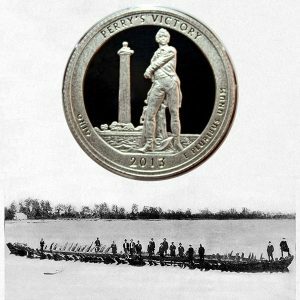 Today, the America the Beautiful Perry’s Victory and International Peace Memorial Quarter Coin remembers when Commodore Perry’s flagship, The Lawrence, was raised from her watery grave on September 14, 1875. During the war of 1812, in which Commodore Oliver Hazard Perry gained prominence and renown for generalship and bravery, in his famous “Victory on Lake Erie,” he was closely connected with The Lawrence, upon whose decks he faced the terrible storming from the British until it became necessary to abandon her. A sketch of this now noted historic vessel seems eminently worthy of space in these volumes. The Lawrence (not St. Lawrence, as she has sometimes been erroneously called) was built, together with her sister ship, The Niagara, at the mouth of a ravine called the “Cascades,” at Erie, Pennsylvania, near where the city water works now are. Her dimensions were 110 feet between perpendiculars, 100 feet of keel, 30 feet beam, and 9 feet of hold. For this I am indebted to Captain William Dobbins, whose father was commissioned as “sail master and pilot” of Commodore Perry’s fleet. The keels of both vessels were laid by Captain Daniel Dobbins, but the boats were built by Noah Brown, the work being conducted under Perry’s own supervision, both being completed and ready for service in four months. The Lawrence, whose keel was one solid stick of chestnut 100 feet long, was launched June 25, 1813, and The Niagara on the fourth of July following, after which she was towed over to Misery Bay, where her masts were put in and her rigging set, and whence she started to meet the foe and cover herself with glory. What she did are matters of history never to be forgotten. She went into the fight on that September morning, flying a flag with Lawrence’s dying words, “Don’t give up the ship,” emblazoned thereon, and after sustaining the combined attack of the enemy’s fleet for hours, drifted out of the line a hopeless wreck, her scuppers running blood and her decks covered with debris of her spars and rigging and the dead and wounded bodies of 82 of her gallant crew. On the deck of The Lawrence stood the gallant Perry, when he led his little navy of nine vessels into the fight. It was his flag ship, and with the exception of The Niagara, the only vessel of war in the fleet, the others having been built for trading. Perry had been lying in Put-in-Bay, near Sandusky, when he discovered the British squadron in the offing. Although the undertaking was a hazardous one, he promptly went out to meet the enemy. The naval supremacy on the lakes was a matter of much moment, and the gallant young commander eagerly seized the opportunity of the test of battle. The British fleet consisted of six vessels— two ships, one schooner, one brig and two smaller vessels, carrying 63 guns and 502 officers and men. The English guns were of longer range than those of the Americans, and as soon as the fight commenced, the enemy concentrated the fire of the greater number of their guns upon The Lawrence, and by half-past two o’clock, out of 101 officers and men on board, only 19 were not disabled, and all her guns were rendered ineffective. When the vessel was no longer habitable, Perry left The Lawrence and carried his flag to The Niagara, which lay half a mile to windward, crossing in his boat under a heavy fire. The combat, which lasted about three hours, resulted in a glorious victory for Perry, and completely established the American supremacy on the lakes. After the battle, The Lawrence was towed back to her birthplace at Erie, and anchored in the bay, whence she had so recently set out. In 1814 she was fitted out to attack the forts at Mackinaw, but she was unsuccessful, and in 1815 sunk at her anchors in Misery Bay, where she remained, a noble monument of that glorious victory, until 1875. Some years ago an attempt was made to raise her for the purpose of equipping her for the merchant service, but having originally been calked with tow instead of oakum, her seams leaked so badly, that it was found impossible to make her available for the purpose, and she was allowed to sink again to her resting-place on the sands of Misery Bay, under the care and guard of the customs officials. In 1875 a company of gentlemen at Erie organized themselves into an association, purchased the old ship, and on Tuesday, September 14 of that year, she was raised again to the surface, amidst the plaudits of crowds who had repaired to the spot to greet the heroic old craft which had so nobly carried the old flag and whose decks had witnessed such scenes of heroism and bravery. She was found lying on her starboard side, and with her timbers in a sound condition, although much of her port side had been carried away by relic hunters, who had sawed off her planking and knees as she lay under water, where she had remained fifty years, and being constructed entirely of oak and chestnut, the action of the water had turned the wood to a purplish black. A large case of articles found among the debris were on exhibition at the North Western Pennsylvania State Fair, held at Erie, in 1875. Among them about a peck of lead musket balls, a lot of grape and canister shot, twelve balls, ramrods, bayonets, marlin-spikes, a hatchet, a pin maul, calking-irons, rings, pike hooks, knives, forks, spoons, awls, a lot of small tools, and many other articles of iron, steel and brass; while among the wooden articles may be mentioned a well-preserved boot jack, a scrubbing brush frame, tool handles, etc. All of them were badly decomposed, but the wooden articles were in a better state of preservation than the metal ones. A few articles worthy of special mention are some old coins — one cent bearing date of 1802, some glass phials from the medicine chest, a bunch of large iron keys belonging to the chests and cabin doors, and some pieces of tin candle moulds. Finally, the remains of the old vessel were loaded on cars and shipped to Philadelphia, to be sawed up and sold for the manufacture of relics, but after arriving there the building in which it was stored caught fire, and it was totally destroyed; thus the glory that hung around one of the chief points of interest in the harbor of Erie was destroyed and the victorious old flag-ship was gone forever. The America the Beautiful Perry’s Victory and International Peace Memorial Quarter Coin shows with an image of the raising of The Lawrence on September 14, 1875.